An important yet oft overlooked part of a dog’s daily grooming is the brushing and cleaning of its teeth. Dogs need a clean and healthy mouth for fresh breath and also for preventing several diseases including heart disease. While doggie mouths are a lot cleaner and naturally bacteria-free compared to human mouths; regular dog teeth cleaning is still very important. In this guide, we will discuss some of the easy ways to clean dog teeth. This step of ‘how to clean dog teeth’ may be a bit late for most pet owners. The key to getting your dog to sit still while you brush its teeth is to start when s/he is a puppy. When you brush daily as soon as your pup turns 8 or 9 months old, s/he can get used to the daily routine. Avoid brushing the dog’s teeth when it still has milk teeth. These fall off and its mouth may be a bit sore for brushing. Dog teeth cleaning at home can become a lot easier when you have all the right dog cleaning products ready. Buy a good quality dog teeth cleaning toothpaste. Never use human toothpaste for cleaning dog teeth. You can also make your homemade dog toothpaste (which we will cover later in this article) with which you can easily clean dog teeth naturally. You will also need a long brush with soft bristles or you can purchase and use finger brushes. In case you do not have a dog brush, you can simply wrap some gauze around your finger to brush your dog’s teeth. When you touch the dog’s muzzle and lips, it understands that it is supposed to open the mouth. Once they do, you can start with the dog teeth cleaning. Work slowly and gently and move the brush in a gentle manner. Make sure you massage the gums and also work on the back and inner sides of the teeth and mouth. Be firm, patient and gentle as you work your way around your dogs’ mouth. Always choose a quiet and relaxed time for brushing your dog’s teeth to reduce dog teeth cleaning risks. Use soothing voice and if needed, you can use firm commands or dog treats to get the pet to cooperate and obey. In some cases, aggressive dogs simply might not allow their owners to touch their mouth and teeth. Years of neglect can cause dog’s teeth to hurt and while most dogs may not show it, you must watch out for tell tale signs. For example, your dog might start refusing hard food or might show preference to soft food. S/he might also have persistent bad breath. 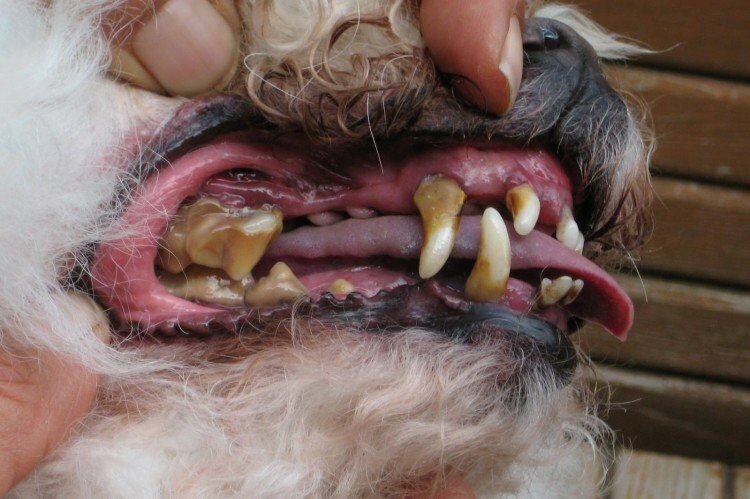 If these signs are present, do not hesitate to go in for dog teeth cleaning vet services. Your vet might use anesthesia to scale your dog’s teeth and remove hardened plaque and tartar. Regular, simple dental cleaning at a vet’s can cost anywhere from $200 to $400 depending on your dog’s age and condition of its oral health. Dog teeth cleaning without anesthesia cost cheaper but it is highly traumatic for the dog. Most vets do not even allow dog teeth cleaning without anesthesia. Many pet owners avoid dog teeth cleaning vet services as they are expensive and also very traumatic for the pet. In such a case, you can try a dog teeth cleaning spray which is effective for dogs having only a bit of tartar on the teeth. Dog teeth cleaning sprays and gels such as Plaque Blast or Denta Sure are very easy to use and are especially useful for pets who do not allow you to touch their teeth or stay away from dog chews. Many pet owners have seen positive results in the form of cleaner, shinier and stronger teeth with such dog teeth cleaning products like spray and gels. Note that some of these dog teeth cleaning products such as dog teeth cleaning sprays can still be quite expensive. One of the easy ways to clean dog teeth naturally is to put the dog food to work. Feed your pet plenty of raw organic fruits and vegetables like carrots, apples etc. These work on the teeth to remove plaque and dog teeth tartar. Good quality kibble will also do the same trick. Make sure your dog gets lot of probiotic foods to reduce bacteria and maintain pH of mouth and digestive system. This is one of the easy ways to clean dog teeth naturally. If your dog is not lactose intolerant, feeding it homemade plain yogurt and buttermilk can ensure that it gets the right probiotic elements for healthy teeth and mouth. You can add a bit of organic raw apple cider vinegar to your dog’s drinking water to keep its teeth healthy. This is one of the easy ways to clean dog teeth naturally without brushing. Apple cider vinegar is acidic in nature and helps maintain the pH of the mouth. It also kills bacteria in the mouth for a healthy oral cavity. Organic apple cider vinegar can also give your dog a shinier and healthier coat while repelling fleas and ticks. You can easily make your own homemade dog teeth cleaning toothpaste with baking soda. Simply make a paste of baking soda and water and apply it on a cloth. Play tug of war with the dog and the cloth so the dog’s teeth get cleaned. You can also rub the dog’s teeth with tuna water or bouillon water as one of the easy ways to clean dog teeth naturally without brushing. Many good quality dog chews can help clean your dog’s teeth and reduce tartar and plaque formation. Make sure you talk to the vet and buy the right dog teeth cleaning products and chews. Avoid ones containing wheat or other substances your dog may be allergic to. Rubber chew toys and doggie chew ropes are some of the easy ways to clean dog teeth naturally without brushing. You can also use dog bones but make sure these do not fracture or shatter causing injury to the pet’s mouth. Dog teeth cleaning can seem like a chore but it is an essential part of your dog’s grooming so s/he continues to enjoy good health for years to come. If brushing your dog’s teeth seems tedious, make sure you at least wipe down the upper surface of his/her teeth with a cloth or towel. This is where the salivary glands are located and where majority of dental issues arise. We hope these easy ways to clean dog teeth help you and your pet.